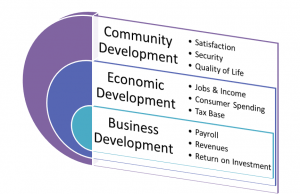 Economic Development can be defined as a program, group of programs, or activity that seeks to improve economic well-being and quality of life for a community by retaining jobs that facilitate growth and provide a stable tax base. (Definition from the Wisconsin Economic Development Corporation website, 2014). Community economic development grounds economic development in the needs, resources, and vision of the community.